Studio 275 is a high-end recording facility for video, audio and music recording. 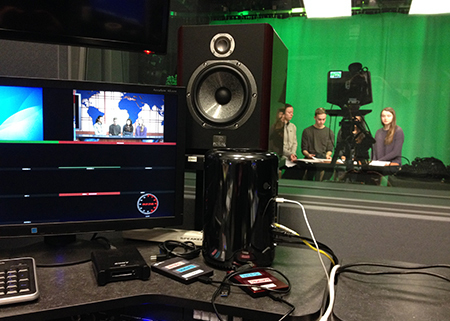 Amenities include a three camera video studio complete with lighting, blue/green screen and live editing capabilities, lightboard technology for complex diagram instruction, Professional Digital Audio Workstation (PreSonus Studio One), 32 channel audio Mixer, headphone stations and high end microphones for music recording. In addition to the main studio recording space we have an Isolation booth for voice overs/narration. Studio 275 is located in the “Production Zone” area of the CET, level 2 of Sawyer Library. Advance reservation is required for using Studio 275 and scheduling preference is given to curricular projects. Please complete this form to begin your request.